In celebration of the Indiana State Fair, which runs from August 5 – 21, 2016, let’s explore several historical items in the Indiana State Library’s Indiana Collection. 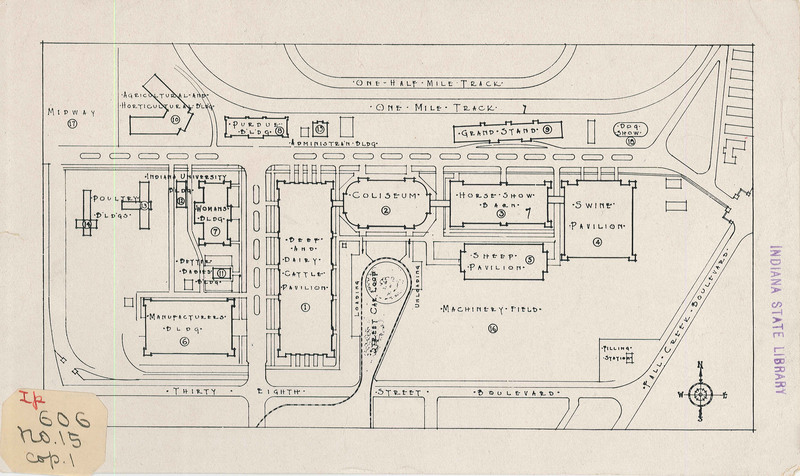 These documents help tell the story of the Indiana State Fair. On February 14, 1851 the Indiana General Assembly passed a law, “An act for the encouragement of Agriculture,” which included the formation of the State Board of Agriculture (Indiana Acts 1850-51, Chapter 3, ISLR 345.1 i385). The primary goal of the Board was to create the first Indiana State Fair, which premiered in 1852. The Board believed that holding a State Fair would place Indiana in a prominent position, as only the sixth state in the nation to hold an annual state agricultural exposition. In an effort to include other cities, the State Fair was held outside of Indianapolis five times: Lafayette in 1853, Madison in 1854, New Albany in 1859, Fort Wayne in 1865, and Terre Haute in 1867. With the increase in railroad transportation throughout the state, it became easier for fairgoers to converge on a central location, namely Indianapolis. 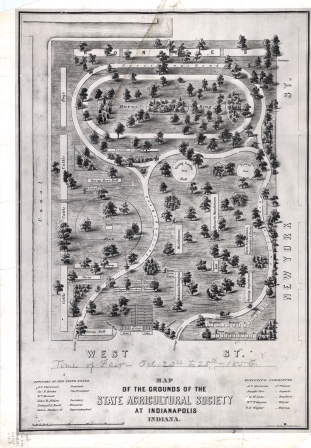 For the 1860 State Fair, the fairgrounds were moved a larger tract of land that had been donated to the State Board of Agriculture. This location on the old Northside was bounded by Delaware, Nineteenth, Twenty-Second, and New Jersey Streets, approximately encompassed by the present-day Herron-Morton Place neighborhood. No State Fair was held in 1861 due to the Civil War and the fairgrounds being requisitioned for military use. Contrary to some historical accounts, the annual event was indeed held in 1862, 1863, and 1864 according to the 35th Annual Report of the Indiana State Board of Agriculture 1885 (ISLI 630 I) and information contained in “A Table showing the Officers, Place and Receipts of each Fair Held by the State Board of Agriculture.” The Board leased the old Military Park tract for the fair. These Board reports contain proceedings of the Board meetings, lists of premiums awarded, detailed crop reports, and information about county-level agricultural societies, all topics of interest to Indiana’s farming and agricultural history. 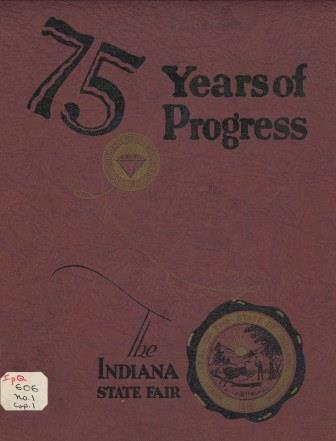 The booklet Indiana State Board of Agriculture: 75 years of progress, 1852-1927 (ISLH 606 no.1) contains a wealth of information about the State Fair, including a bird’s eye sketch of the old Camp Morton location of the fairgrounds. 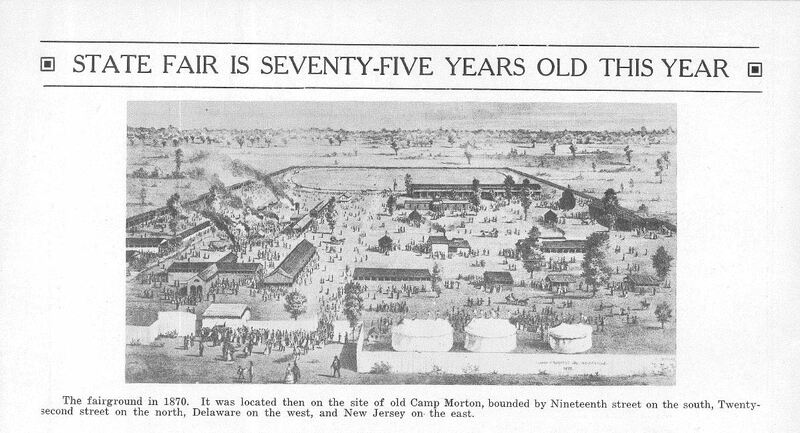 The State Fair eventually outgrew its second location, and it opened in 1892 at the third and much larger site on 38th Street, west of Fall Creek Parkway. The site is the current location of the State Fairgrounds. Many of the buildings indicated on the 1939 Plat of the Indiana state fair ground (ISLO 606 NO. 15) still exist today, albeit under slightly different names. During World War II, the State Fairgrounds was needed for Army Air Forces use. For the years 1942, 1943, 1944 the State Fair was not held in its usual festival format; it was scaled-back to 4-H competitions only. The Indiana State Fair continues to be a tradition for everyone to enjoy. The theme for the 2016 Indiana State Fair is Celebrating Indiana’s Bicentennial. Come stop by the Indiana State Library’s booth in the Visit Indiana Bicentennial Pavilion building. See you there!